Brewing the American Dream: Partnership between Samuel Adams and Accion in the U.S. The Samuel Adams Brewing the American Dream program serves as Accion’s flagship food and beverage partnership in the United States, bringing together our mission-based organization with the entrepreneurially-minded brewer Samuel Adams. Small business owners are champions of job growth in our neighborhoods, but they’re often turned away by traditional banks and not provided the know-how to succeed. 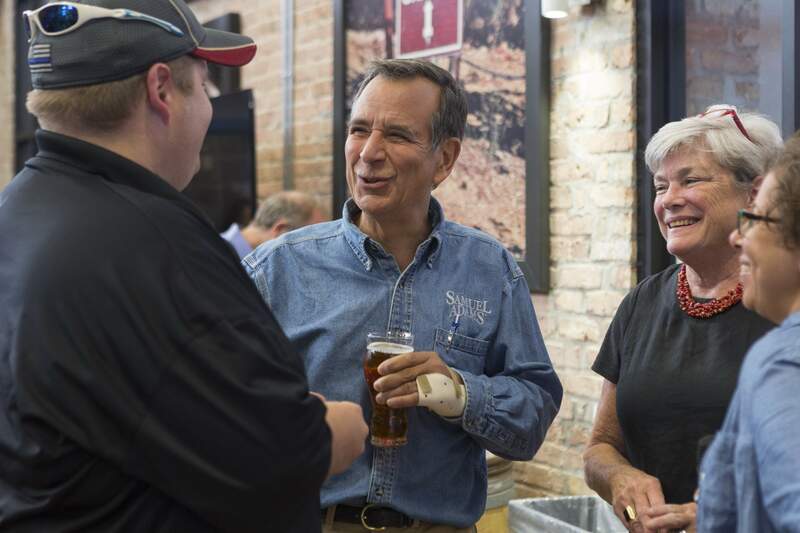 Jim Koch started Samuel Adams in his kitchen in 1984, and after 34 years of brewing success, he never forgot how difficult it was to start and run a successful small business. Jim created Samuel Adams Brewing the American Dream in 2008 to provide support to business owners in two areas he wishes he had help with when launching Samuel Adams: real-world business advice and a loan. Over a decade ago, Samuel Adams reached out to Accion’s Cambridge office about forming a partnership where Accion would provide the loans and Samuel Adams would tap into its employees’ more than 25 years of expertise in the food and beverage industry to provide mentoring to small business owners. Through the partnership, 8,000 small businesses have been coached and mentored. The program has also supported Accion in providing nearly 2,000 loans totaling over $25 million to food and beverage businesses that are creating or retaining approximately 7,000 jobs. Jim Koch, Founder and Brewer, Samuel Adams. Accion supports microfinance across the globe, and in the U.S., we put capital directly in the hands of entrepreneurs starting or growing small businesses. Samuel Adams has supported Accion in lending over $25 million since 2008, with an average loan size of about $14,000. Brewing the American Dream’s signature event is an opportunity for entrepreneurs in the food and beverage industry to access personal expertise from Samuel Adams team members, local experts and Accion partners in a casual, dynamic environment. The event includes multiple coaching sessions, so entrepreneurs can speak with several experts in a matter of just a couple hours. For those Accion clients interested in specific, actionable advice, the one-on-one mentoring opportunity offers a chance to connect directly with experts at Samuel Adams to overcome a particular challenge or open the next door for the business. Since Brewing the American Dream serves the entire country, virtual meet-ups and digital engagement are critical for entrepreneurs who’d like assistance but don’t live near a Speed Coaching event location. Webinars create a space for knowledge sharing and free advising on topics such as package design, marketing, real estate, distribution, and much more. Accion clients are periodically featured on Samuel Adams packaging, point of sale materials, social media channels, and through traditional media interviews in connection with Brewing the American Dream. This extra exposure allows Accion clients to reach potential customers much more broadly than they might otherwise be able to do. Learn more about Brewing the American Dream and Accion’s work in the U.S.
Can investors empower women and lift people out of poverty?